Finnish physicist Tuomo Suntola has won the Millennium Technology Prize 2018 for his atomic layer deposition (ALD) technology invention. Suntola’s ALD innovation is used in various electronic devices, improving people’s lives on a daily basis: whenever we use smartphones or switch on an LED light. 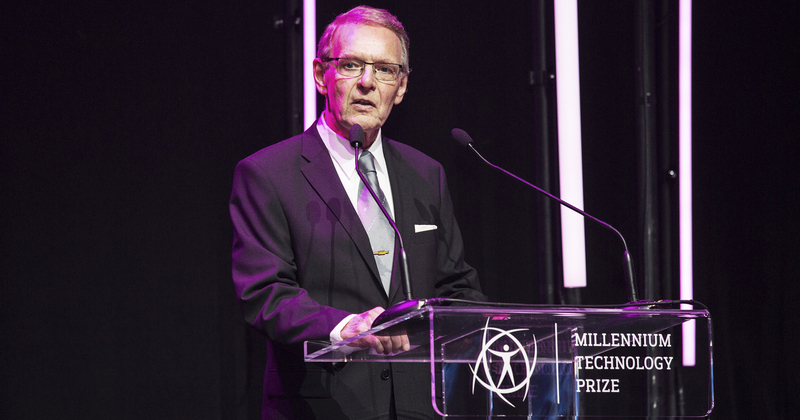 Tuomo Suntola has won the eight biennial one-million-euro Millennium Technology Prize. The award was presented by the President of Finland, Sauli Niinistö in Helsinki on 22 May 2018. Suntola is the first Espoo citizen and only the second Finn to win the award. ALD is a nanoscale technology that is used to manufacture ultra-thin material layers for microprocessors and digital memory devices. By using the technology, it is possible to build complex, three-dimensional structures one atomic layer at a time. Millennium Technology Prize is awarded to an innovation that improves people’s quality of life and promotes sustainable development. While ALD has a massive technological impact, people also experience benefits of ALD every day – without even knowing. The continuous development of the technology has enabled IT equipment to become what they are today. "The benefits of ALD technology can be seen in all electronic devices. The technology enables IT equipment to be smaller and more powerful," Suuntola says. Whether it’s smartphones, high-efficiency computers, LEDs, photovoltaics or even coins, ALD improves not just the efficiency and size but also increases the durability and lifetime of the end product. This was only the second time the Millennium Technology Prize was awarded to a Finn, with Linus Torvalds winning it in 2012. Suntola, however, is the first Espoo citizen to win the award. The city of Espoo has been an integral part of the psychist’s personal life and career. Suntola can be called one of the original Espoo citizens. With his family, he moved to Kilo in 1973 and has lived in the same house he started building the year before – the year when Espoo gained city rights. "Espoo is a wonderful place to live in. The technology hub in the Otaniemi area is also a special place," Suntola says. Otaniemi, the heart of the Espoo Innovation Garden ecosystem, has indeed been a special setting in Suntola’s story. He is an Aalto University alumnus, earning his Ph.D. in 1971 in electron physics from Electrical Engineering Department in Helsinki University of Technology. The school is now part of Aalto University, but already back in the 70s it had a department in Otaniemi. Suntola also worked as a scientist at VTT Technical Research Centre of Finland in the early 70s, at the time when VTT moved to Otaniemi. Suntola is now retired but he still remains active both in the area and in the ALD industry as a is a board member of Picosun Oy, a fast-growing ALD tool company located in the Espoo Innovation Garden ecosystem. Picosun is one of the leading companies in the field and a prime example of a Finnish company that is carrying Suntola's ALD legacy onwards. In the Espoo Innovation Garden ecosystem big companies, startups, and students from different fields co-operate to create innovations, with Aalto University being one of the key players. Suntola says that it is highly valuable that different strands of education, students with different interests, and companies from various industries come together at Aalto. After all, the story of his ALD invention that brought him the Millennium Technology Prize started out from similar co-operation between his school and the industry. "It is important that we are open-minded in our approach. Understanding and co-operation is very important – whether it's between students, faculties or between basic and applied research," says Suntola.